Sodium is classified as a macromineral, along with calcium, chloride, phosphate and potassium, because it's needed in larger amounts than trace minerals. Sodium is vital to good health, helping your muscles, heart, brain and bones work properly. However, consuming too much sodium can result in high blood pressure and a host of resulting medical problems. Sodium occurs naturally in many foods, such as milk, beets, celery and even the water you drink, says the National Institutes of Health. 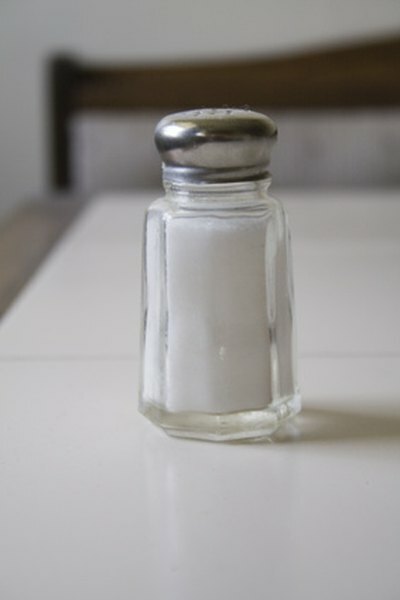 Sodium chloride is another name for common table salt, which you use to flavor your foods. Other types of sodium chloride are used to preserve food and prevent food-borne illnesses. Although you can get the sodium you need from foods that naturally contain it, the American Heart Association states that up to 75 percent of people in the United States get their sodium from processed foods—and they eat far too much sodium. Your body uses macrominerals such as sodium as electrolytes, which help you maintain normal fluid levels in your cells, the space around your cells and in your blood. Having your electrolytes in balance is crucial to maintaining the right fluid balance in each of these compartments; when an imbalance occurs, sodium "moves" fluid from one compartment to another accordingly, explains the Merck Manuals Online Medical Library. Your kidneys help your body maintain the right balance of sodium, filtering some of it into your blood and removing excess amounts through your urine. Although sodium is essential, you actually need very little of it, according to the AHA. The Recommended Dietary Allowance of sodium for adults is 1,000 milligrams, with a safe upper limit of 2,400 milligrams. Given that a half-teaspoon of salt contains 1,200 milligrams of sodium, it's easy to go overboard, especially if you eat a lot of processed and fast foods. The AHA advises you to read packaging carefully when purchasing prepared and packaged food items. Defer to the Nutritional Facts panel of the label, where the amount of sodium is listed in milligrams, as well as the percentage of your Daily Value that a serving of the food gives you from sodium. Excessive sodium can cause high blood pressure in sodium-sensitive individuals, says the NIH. Too much sodium can also cause fluid to build up, which can be a serious concern for people with congestive heart failure, cirrhosis of the liver or kidney disease. People with high blood pressure should limit sodium intake to 1,500 milligrams daily, says the NIH. Those with heart, kidney or liver problems may need to consume far less. Most people in the U.S. consume twice as much sodium as they need. To cut back, eat more fresh fruits and vegetables and fewer processed foods, such as bacon, ham and lunch meat. Omit the salt from recipes. Instead of using salt to flavor your food, choose herbs and spices instead. Avoid sodium-laden condiments, such as soy sauce and ketchup. Finally, go easy on salt substitutes. These usually contain potassium chloride, which may not be appropriate for people with kidney problems or who take drugs for congestive heart failure or high blood pressure.